In the Basic information area, in the Name box, type a name. In the Group box choose a group to which the activity belongs. Each group has an internal price per hour. You can change this price/group or add a new one via the InLoox PM options. For more information, see Generate and edit groups. In the Highlight area, select from the Flag drop-down list a color to mark the activity in the planning list. You can also select a color to mark the activity in the Gantt chart by clicking Color . In the Summary activity box, select a group or parent, to which the activity belongs. InLoox PM creates a chronological interdependency between the activity and the selected successor. InLoox PM consequently deletes the chronological interdependency between the activity and the selected successor. Click Collapse to structure the Available list clearly and collapse all groups. 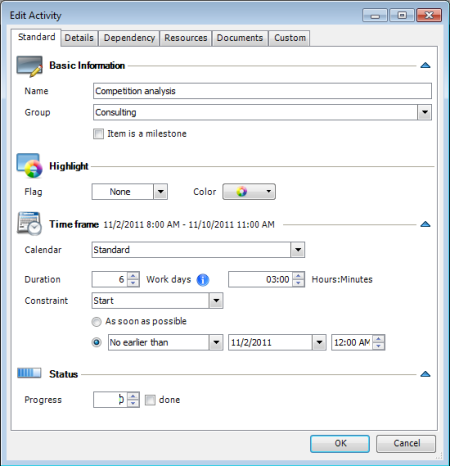 How to add and edit a planned activity | InLoox PM 7 • Copyright 1999-2019 © InLoox, Inc. All rights reserved.